For me it was a big step from the family canoe to my first kayak. From there I learned to love spending time on the water and fell in love with the agility and freedom of a kayak. If you’re like me, it probably didn’t take you long to yearn for more. That’s why you’re here – to learn how to pick out the best touring kayak. My goal is to help you figure out everything you need to know in order to choose the right touring kayak for you. Together we’ll cover all the details you’ll need to know. I’ll answer all of your questions and a few you may not have even thought of! Now, I’m going to make a few suggestions of some top rated touring & sea kayaks you can choose from. 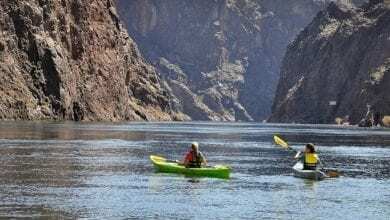 For more of my top gear recommendations, have a look through these popular Outside Pursuits guide links: Kayak Paddles, Kayak Life Jackets, Kayak Seats. 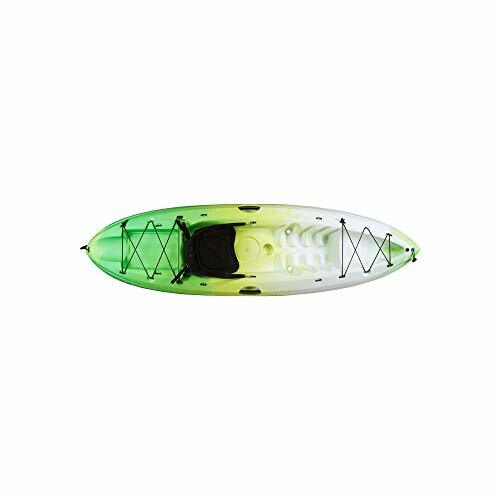 Perception keeps their lines of kayaks small and focused. They’re a high end manufacturer that creates amazing touring boats but won’t break the bank. This 15’ boat is loaded and ready for serious touring and capable of handling some nasty weather! 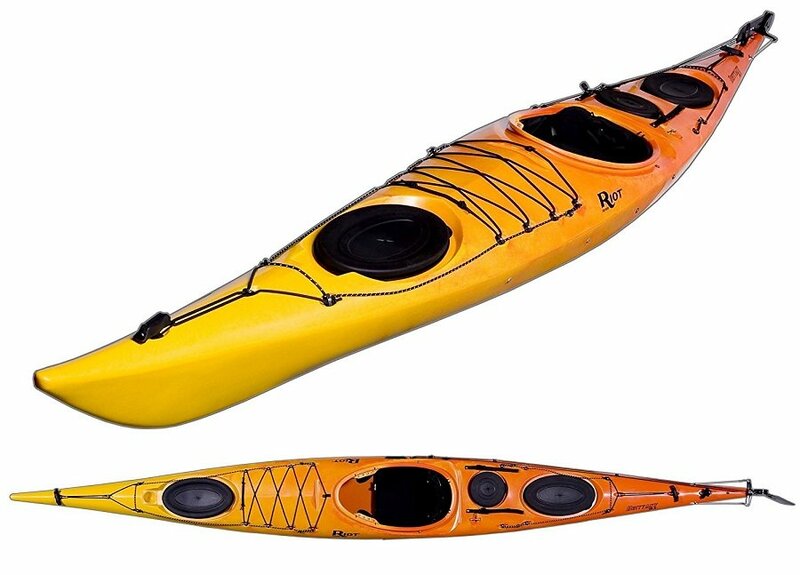 Perception produces this kayak with a slim cockpit that is well padded and fitted with an adjustable ergonomic seat and thigh pads to lock in your control of the boat while staying comfortable. They kept the overall cost of the boat affordable by choosing polyethylene as the material choice. Despite this, the boat still boasts significant glide speed and initial stability. There’s plenty of deck rigging to hold gear. Plus, the two sealed hatches have a backup strap so you don’t have to worry about dumping gear in the drink if you roll. Overall this boat is in the mid-long range for a touring boat. It features a low profile for efficiency and the relatively flat, long keel plus rudder helps the boat track well over long distances. Best For: Paddlers looking for the best touring kayak that won’t break the bank. Just like the Perception kayak this boat has two reinforced sealed hatches. It’s also available in two colors, yellow and fuschia. Where the difference really comes in is that the cockpit is more ergonomic and more comfortable over long distances. It has a more shaped design than the Perception kayak which features a relatively narrow and straight cockpit. It’s a small feature change that makes a big difference when the hard plastic of the boat won’t move and your hips are squeezed between it uncomfortably. The Perception kayak also includes two rod holders if you feel like trolling for some fishing while your paddling. Other than that there’s nothing majorly different between the two but it is about $250 cheaper. The long, low profile combined with the integrate rudder makes the boat easy and fun to control. Best For: Paddlers who want to avoid breaking the bank when choosing their touring kayak. This British-style sea kayak is ready to hit the water loaded with features. It might be one of the most feature-rich boats on our list. And, it’s miraculously affordable. Let’s start with the skeg and rudder. Included on this boat is an integrate rudder. The rudder can be retracted for storage, travel, or when you don’t want it. Also included is a retractable skeg. When in use it stabilizes the boat and can be used with or without the rudder. I like that this boat features three hatches. Each with a separate compartment it’s one of the biggest storage options of any boat on our list. 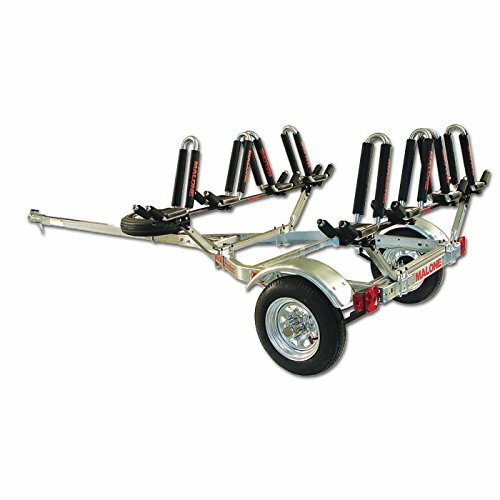 There’s also an abundance of deck lashing which provides an additional storage option for those times when you’ve got to haul a load. 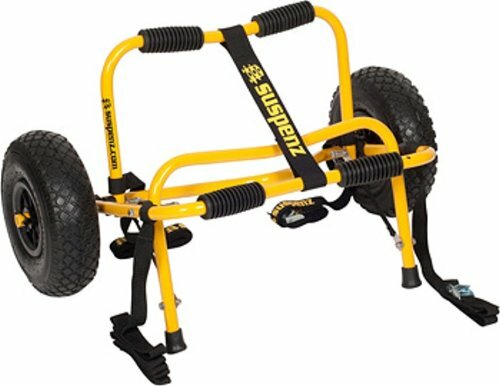 Other small features include the custom fit seating which combines with the adjustable foot braces and thigh braces to create a fully fitted ride. 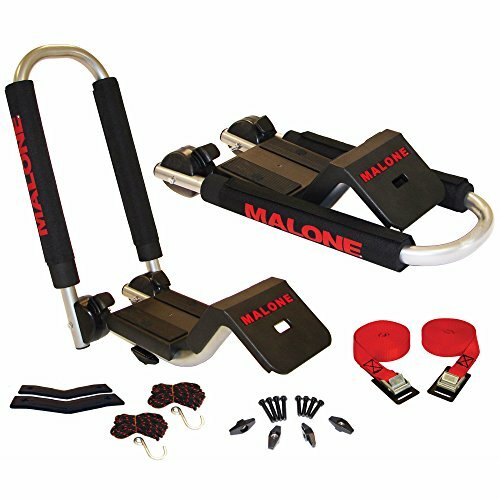 There’s also an included reflective lifeline, paddle hook for storing your paddle, and safety straps. 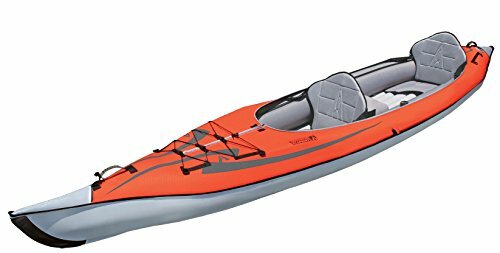 Best For: A larger profile touring kayak with tons of storage and maybe the best sea kayak. Boreal Design makes a ton of great touring kayaks so be sure to check out their full line. This 15’ kayak is made for day or weekend touring trips when a longer kayak just isn’t needed. When you want a bit more agility than a 17’ boat but don’t need the extra storage, the Sedna is an ideal companion. Made with tons of deck lashing and two ample hatches, there’s room for gear for an overnight or a day trip. Included on the boat is an integrate rudder system which, of course, is easily retractable when not needed. Inside the cockpit is an adjustable seat, foot braces, and thick braces. The boat is soft chined which can help rough waters roll off when the waves start to chop. There’s nothing crazy going on here – just a solid touring boat ready for a mix of adventures. Thanks to the shorter size and soft chines on this boat it’s perhaps the best day / weekend boat on our list. Join your friends for a recreational river paddle or head out for a weekend of camping in your own. Best For: Covering all your bases with one boat. Touring kayaks are a step away from recreational kayaks. Their goal is typically to have more storage space and a more efficient long distance capacity. Sometimes we need a hybrid before we commit fully to the world of touring. This generously sized cockpit has some of the comfort of a recreational kayak with some of the features of a touring boat. Integrated thigh braces make it easy to control and brace the boat. While the large cockpit is much more generous than a standard touring boat. Made from polyethylene, this boat is by far the most affordable on our list. Thanks to its shorter length the boat weighs just 42 pounds which makes it more portable for some users. There’s even an integrate fishing rod holder if you feel like doing a little cross-sport. Overall the boat has a relatively flat rocker and hard chine which makes it a faster boat. While the short length might make the boat a bit less efficient, the skeg all but makes up for that. This boat is mostly a hybrid of touring and recreational features at a low price point. Best For: Budget paddlers who aren’t sure they want to commit fully to the world of touring boats. Choosing the right touring kayak starts with understanding the way that kayaks are created, shaped, and designed. Once you’ve learned these fundamentals, you’ll be able to look at any touring kayak and know whether or not it’s likely to be a good fit for your needs. There are a handful of synthetic and natural materials from which touring kayaks can be crafted. Each one has its own unique properties and distinct pros and cons. Choose the correct one for your needs, skill level, and budget. 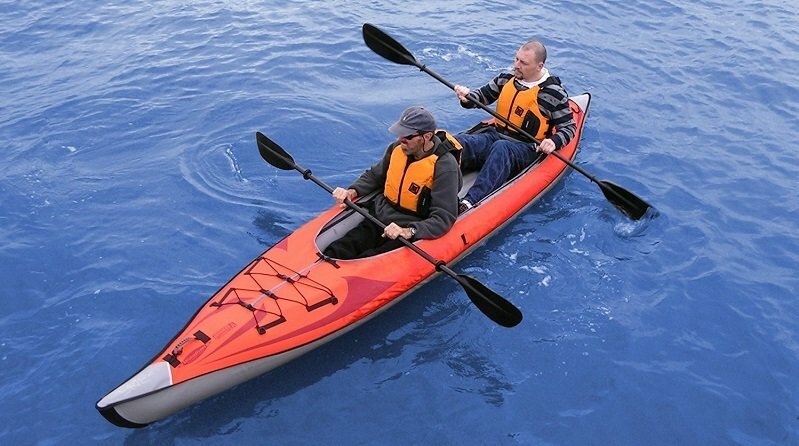 Polyethylene – is one of the most common kayak materials. 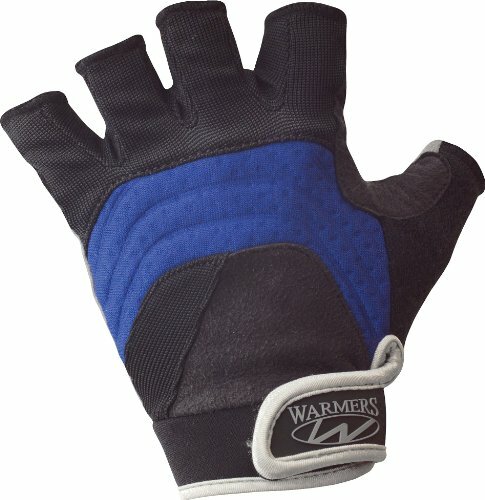 It is slightly flexible and resists impact well. That means it’s not too likely to crack a hole if you ram it ashore or bounce off a rock. On the downside is that Polyethylene is quite prone to UV damage over time from sun exposure. This won’t be an issue unless you store the kayak in sunlight or use it a lot. Polycarbonate – looks and feels a lot like polyethylene but has a few advantages. Polycarbonate can be crafted into a smoother hull which glides more efficiently through water. 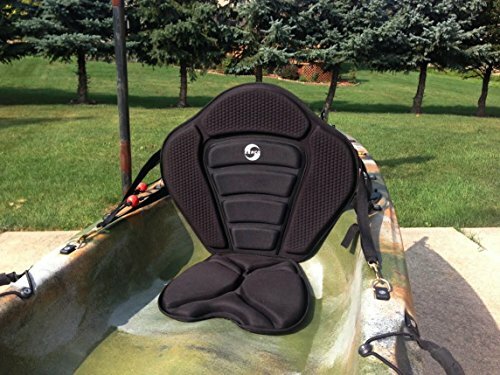 For a touring kayak this is ideal because it makes long days of paddling easier. Ideal for upgrading efficiency without paying through the nose. Fiberglass – is a common body working material that you can find at your local hardware. In theory you could cast your own fiberglass kayak relatively easily! It’s a popular choice because of its durability, light weight, and the ability to retain a very sleek, smooth surface polish. Buying a fiberglass kayak will cost you quite a bit more than a poly boat. Wood – kayaks are possibly the most rare form of kayak. Like fiberglass canoes they can also be made at home. They’re generally nosebleed expensive because they take tons of time and craftsmanship to create. Wooden boats can be extremely efficient, durable, and fun to paddle when built well. It’s worth mentioning that carbon fiber can sometimes be found in use for racing kayaks. Hull shapes refer to the shape of the boat if you were to cut it in half and look at it head-on. Each type of hull design is intended to excel in certain characteristics. Not all hulls are created equal and each type has its pros and cons. 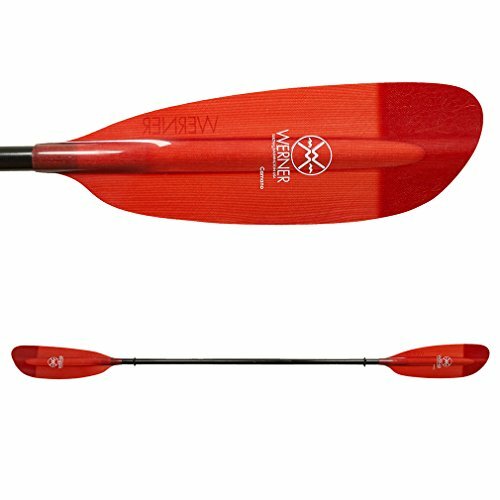 V-shaped – hulls are by far the most common and effective on touring kayaks. These hulls form a very sharp V shape under the boat and are not rounded like a U. They can be squirrelly at first and have poor initial stability. Once under motion they perform efficiently and cut the water like a blade. Rounded – hulls could be accurately described as U-shaped hulls. They are usually uniformly round or may change angle at some point. However they are much more gently sloped than a V-shaped hull. These boats have poor initial stability but perform well when on edge. Flat and Tunnel – hulls are the other main designs in use today. These are both ill-suited for touring boats as they’re less efficient and offer better stability when sitting still rather than paddling. Touring boats will rarely, if ever, feature one of these designs so we won’t go into them. These little kayak features are important to understand. Chines can be described as the physical area where the side of the boat transitions into the bottom of the boat. Chines can come in many shapes and sizes and some boats even have more than one chine. Chines are usually described as either soft or hard. A hard chine would be akin to a right angle, while a soft chine would be akin to a rounded corner. Hard chined boats have what might appear to be a crease that runs along the length of the boat. A noticeable depression in the material of the boat. Hard chines result in good stability when upright and exceptional speed and tracking. Soft chined boats may have little or no visible “crease” but instead might appear more seamless. Soft chined boats have great stability when tipped on a side (secondary stability). These boats perform well in rough waters where the waves can simply slide off the rounded chines. They’re not as fast as hard chined boats, however. You’ve already heard this mention and probably figured it out by now. Part of choosing the right kayak is knowing what kind of stability you’re in the market for. 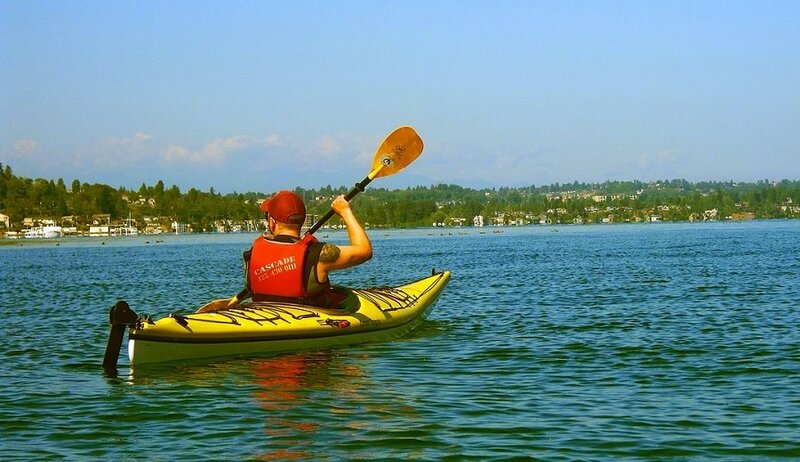 Depending on many features, a kayak may have primary stability, secondary stability, or a mixture. Primary stability – refers to how stable a boat is when positioned upright. This also has a great impact on stability when the boat is sitting still, such as when you enter the boat or if you were to be fishing from the boat. Secondary stability – is a measure of how stable the boat is once it has been tipped. 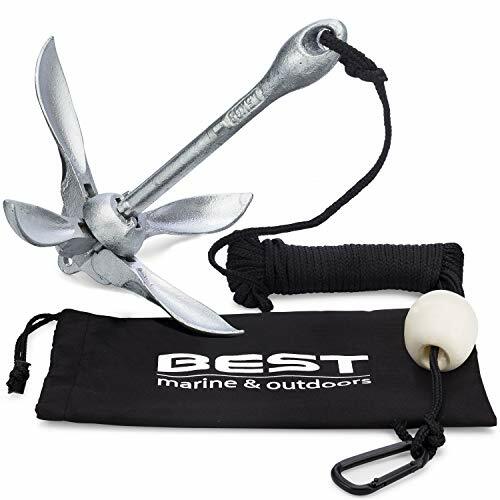 Secondary stability is great for rough seas in open water conditions or for whitewater boats. For most touring boats secondary stability is less important. We talked about hull shape which is the shape of the boat from a head-on perspective. Now imagine the kayak from a side perspective. This is where rocker comes into play. If you’re a skier then you’re already familiar with the term rocker. A rockered boat, or ski, is up turned like a banana. When set flat on the ground both the bow and stern are lifted off the ground in an arch. Most boats have some amount of rocker. Rocker helps aid in maneuverability because the bow and stern have less material submerged. That way when paddlers input turning forces to the boat, there’s less to resist the turn. In touring kayaks having less rocker is usually preferable. A flatter touring kayak leaves more of the boat underwater at the bow and stern which aids in tracking straight lines. When paddling long distances efficiently, we want to minimize the amount of zigzag from paddle input. While kayaks can span the spectrum from ~5’ to 18’+ touring boats tend to be on the longer side of the spectrum. Why? Because longer boats have more room for storage. On touring trips you’ll need all the space you can get for fitting in gear, food, and shelter if you’re camping. Storage needs aside, a longer boat also tracks and cuts through the water better. Like avoiding rocker, having a longer boat aids in the tracking and efficiency of a touring boat. These two factors make a longer boat of 14’-18’+ the norm for touring. Q: Should I get a single or tandem kayak? A: Not as common for touring kayaks but if you have a child that you think you may want to take with you then you will have little choice but to get a tandem. If you have a spouse or friend you may be better off with two single kayaks. It saves a lot of disputes! Of course if you just want the extra room or plan on taking along an extra paddler, a tandem may be a better option. 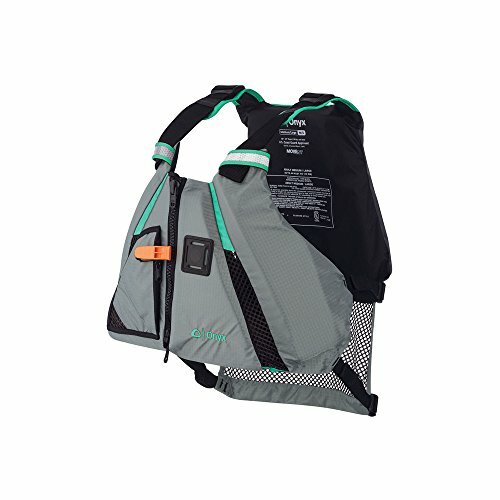 Q: Do I need to wear a PFD? A: Legally you must have a PFD or life jacket on board at all times. Children are required to wear one at all times. A PFD that is strapped in the back of the kayak will do you little good however if you tip over. Get a inflatable one and wear it at all times. They are light and thin, you will not even notice are wearing it. Q: Does color of the kayak matter? A: If you plan on kayak where there are motorized boats around I would recommend bright colors like orange and yellow so you can be more easily seen. Q: Will I get wet when I am kayaking? A: Yes! It is inevitable no matter what type of kayak you use. Less so with a sit inside kayak. Q: Is it worth spending more for a light carbon fiber paddle? A: Short answer, yes. Your paddle is your engine, the lighter the paddle the easier it is and the less fatiqued you will get. Q: Is a longer or shorter kayak better? A: As a general rule of thumb, the longer the kayak the faster it is and the better it tracks, so for touring kayaks generally longer is better. Spray Skirts – are important features of almost all touring kayaks. They keep water from lapping into the boat during rough waters or rainy weather. These are commonly included with touring boats. Skegs – are a metal or plastic plate which are usually removable. They attach to the keel of the boat and help with tracking and efficiency. These are common on touring boats. Rudders – are all about directional control. A rudder, when properly used, can help with correcting for wind or paddling error. Finding the right touring kayak can take some time. Everyone has a different budget. Plus, the boat you choose depends on whether you want to be out for a day, weekend, or an entire week at a time. Some of the boats on our list are gender neutral, some are specific. Each boat has a unique set of features that makes it a good choice for some users. Be sure to go back and look over the “how to choose” section to freshen up on touring kayak features. No matter what boat you choose, we all grow into new preferences and skills with time. Don’t be surprised if some day you find yourself moving to a new touring kayak that fits your developing needs. For now, just start with where you’re at and make the best choice for you! I hope this guide was helpful for finding the best touring kayak to fit your needs. If you want to comment or recommend a kayak I didn’t include, please use my contact form to get in touch.